DC Bombshells is one of the strangest superhero success stories of the last few years. A comic series based on a line of statues imagining the women of DC Comics as 1940s pin-ups didn’t sound like an especially promising concept, but luckily the title had a creative team that valued character development and dynamic storytelling while still delighting in the inherent sexuality of the designs. Writer Marguerite Bennett gave the book a playful tone and made queer relationships a major part of the narrative. 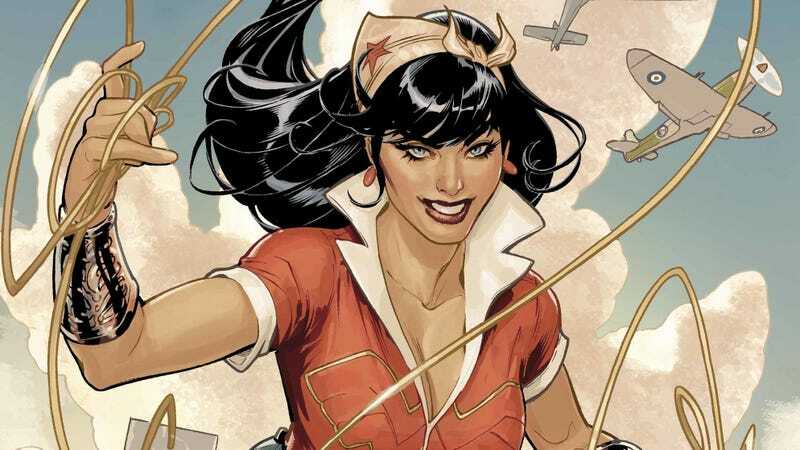 She took advantage of the book’s World War II setting to tell more substantial stories rooted in historical events, and that continues in the new Bombshells: United series, which brings back the team to tackle a domestic problem: the internment of Japanese citizens by the U.S. government. Bennett is reimagining Wonder Girls Donna Troy and Cassie Sandsmark as second-generation Japanese-Americans whose families are being held in camps, and they’ll be joining forces with Wonder Woman to fight Executive Order 9066. This exclusive preview of next week’s print edition of Bombshells: United #1 also features the return of Marguerie Sauvage, whose soft, vibrant artwork is unlike anything else in superhero comics. Because the digital copies of Bombshells use half-pages instead of full pages, artists often end up laying out their pages as two halves stacked on top of each other without regard for how that flows in a single printed page, but Sauvage is not one of those artists. She’s always aware of what the design will look like in both digital and print, and starting this issue with a nine-panel grid shows that she’s not beholden to the half-page when there are more ways to make the art flow differently in digital. That nine-panel grid becomes three separate pages of three , andpanels it would be very nice to see the other Bombshells: United artists follow Sauvage’s lead with their page layouts.